A glasses-wearing, mild-mannered kid from Roseau, Rube Bjorkman ignited so many imaginations and created such a buzz when he first hit the Twin Cities in the 1940s, he might just as well have been a comic book character instead of a high school hockey phenom. The true mark of Bjorkman’s superhero status were the nicknames. They stuck to him like wet snow on a shin pad. 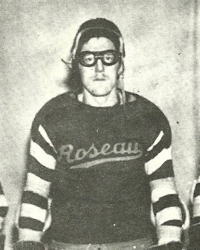 Sports writers in the Twin Cities papers took to calling Bjorkman “Masked Marvel” when he arrived at the 1946 state tournament as Roseau’s electrifying scoring star. The state tournament was in just its second year, but already it had captured the attention of hockey fans throughout Minnesota. 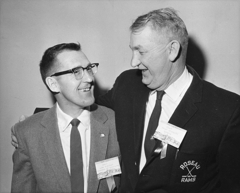 As a sophomore, Bjorkman had attended the first state tournament as a fan, making the long drive south to the St. Paul Auditorium with a few other Roseau players and their coach, Oscar Almquist. “It gave us something to really shoot for,” Bjorkman said about watching the 1945 state tourney. Fully inspired to write their own chapter in state hockey history, Bjorkman and his Roseau teammates beat Warroad and Thief River Falls the next year in the Region 8 playoffs to punch their ticket to St. Paul. Roseau slipped past White Bear Lake 2-1 in the quarterfinals, then beat St. Paul Johnson by the same score as Bjorkman registered a goal and an assist. 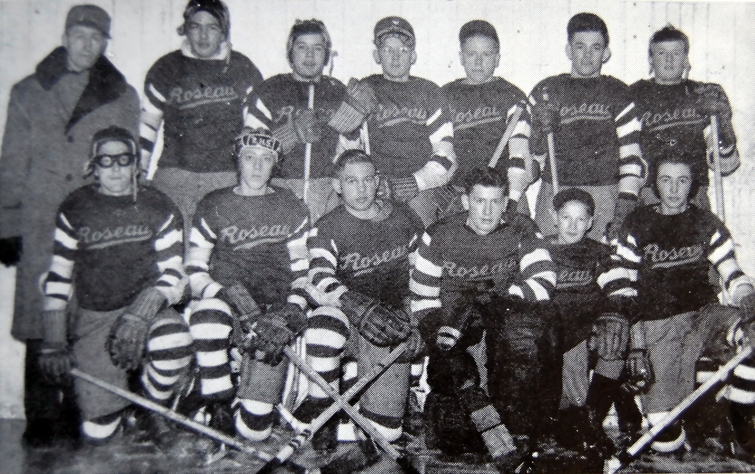 In a tournament that had been filled with low-scoring, one-goal games (of the four quarterfinals and two semifinals, only one of those six game was decided by more than one goal), Bjorkman scored a hat trick in Roseau’s stunning 6-0 drubbing of Rochester in the championship. “It was the biggest thing that ever happened in my life up to that point,” Bjorkman said. “It opened up all the doors to me hockey-wise. If we hadn’t have made it to the state tournament, who knows what would have happened. Bjorkman wasn’t done yet. 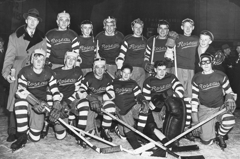 As a senior in 1947, he again led Roseau to the state tournament. Bjorkman scored twice in Roseau’s 5-0 quarterfinal victory over St. Cloud Tech and again had two goals as Roseau beat Eveleth and goaltender Willard Ikola 4-1 in the semifinals. Bjorkman said hockey was the winter activity of choice in Roseau when he was growing up. “We didn’t have all the distractions,” he said. “We were lucky if we had a radio. There wasn’t a TV. You were either outdoors or you were sick. 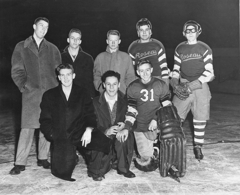 In the 1947 state championship game, Roseau trailed St. Paul Johnson 1-0 entering the third period. Bjorkman tied the score just 24 seconds into the third, but the Governors came back to win it 2-1 on a goal in the closing minutes. 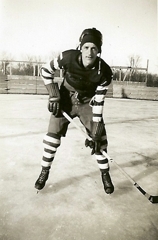 Sports writers gave Roseau's electrifying Rube Bjorkman the nickname "Roaring Rube" along with the "Masked Marvel." Bjorkman was named to the all-tournament team for a second consecutive year. Along the way, he also picked up other nicknames, “Roaring Rube” and the "Man from Mars" among them. 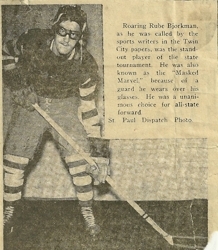 “Masked Marvel” remained the Twin Cities media’s preferred nickname for Bjorkman. Almquist, realizing the importance of protecting his star player’s eyesight, bought the nearsighted Bjorkman a pair of rubber goggles with prescription lenses. In some descriptions, Bjorkman’s distinctive protective eyewear is described as aviator goggles, in others it was compared to a welder's eyewear. Bjorkman said the goggles were more similar to what swimmers would wear. “I wore glasses back in those days there was no such animal as contact lenses,” said Bjorkman, who went on to become a successful high school and college coach and lives in Warroad. “There were no facemasks in hockey in those days. So I couldn’t have worn spectacles. But I did have that pair of safety lenses, very thick ones. 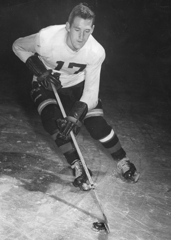 Bjorkman went on to play for the University of Minnesota from 1948-51. He also played on two U.S. Olympic teams, in 1948 and 1952. As a coach, Bjorkman led RPI to the semifinals of the national tournament and also led the college programs at New Hampshire and North Dakota.